The Palestinian president is also anxious during his visit to the Netherlands to explain his renewed attempt to breathe life into the Middle East peace process, and to seek support for this initiative. In the past week he has received assurances of support from British Prime Minister David Cameron and Russian President Dmitri Medvedev. The Arab League has also given its support to the Palestinian President’s moves towards rapprochement with Hamas and his proposal that parliamentary and presidential elections be held later this year in the West Bank and Gaza. In Kox’s opinion it is vital that the Netherlands offer the Palestinians support, especially at a time when struggles for more democracy and justice are continuing throughout the Arab world. During the meeting in Ramallah Kox also invited the Palestinian president for further consultations with the Parliamentary Assembly of the Council of Europe, an invitation to which Abbas responded positively. The SP Senator is responsible for looking, on behalf of the Council of Europe, into the request of the Palestinian National Council for closer cooperation. In connection with this he held talks last week with Prime Minister Fayyad, Foreign Minister Riyad Al Malki, Justice Minister Ali Khashan and other members of the Palestinian government. 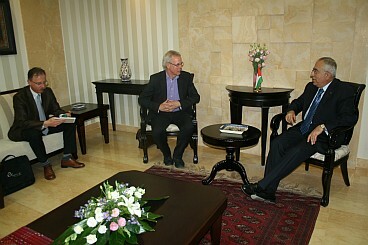 He also met with Palestinian National Council Chair Salim Al Zanoun and representatives of the various political parties, including Hamas and Fatah, of Palestinian trade unions, human rights organisations, the Palestinian women’s movement and the Palestinian media, the Palestinian auditors’ office and the judiciary. In Bir Zeit he spoke with representatives of Palestinian universities and in Jerusalem with the European Union representation.